‘Fruit about the same size as that of the Saint Germain, and not much unlike it in shape; oblong, and tapering to the stalk; about three inches and a half long, and three inches in diameter. Eye small, open with a very short calyx, scarcely or but very slightly sunk. Stalk one inch and a half long, rather slender, inserted without any cavity; in some specimens it is diagonally inserted under a broad elongated lip. Skin dark green at all times, even when most ripe, sprinkled with many russetty specks. Flesh greenish white, melting, rather gritty at the core, but of a delicious rich flavour. The fruit generally shrivels in ripening. In eating from December till March or April.’ [George Lindley – Orchard Guide p.409/1831]. ‘Described by Dr. Van Mons as being the best of the late Pears, keeping from December to May. This is, perhaps, to ascribe too high a character to the variety, which is, however, undoubtedly of rare excellence, not only on account of its flavour, but also of the capability it possesses of keeping sound and in perfection till a late period of the spring. 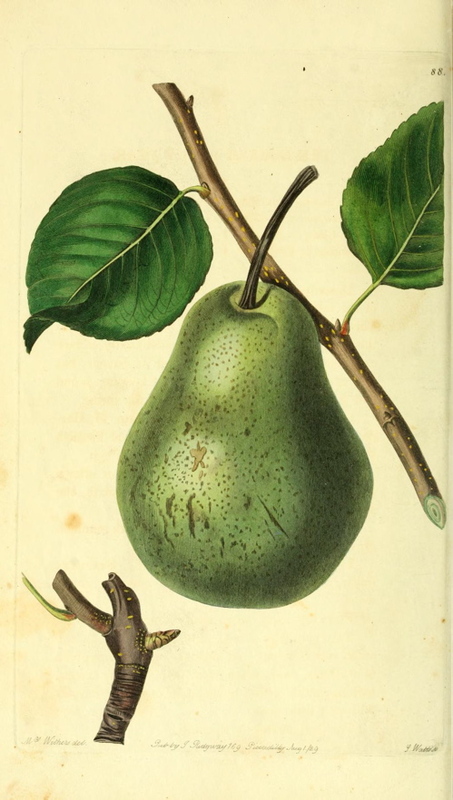 It was raised at Mons by the late M. Hardenpont, by whom a number of other good Flemish Pears were obtained from seed some years ago.’ [PM t.88/1829]. It was found growing at Rance, in Hainault, in 1762, by M. Hardenpont of Mons. [HP pl.LXVIII/1878]. Also figured in Le Jardin Fruitier du Muséum [JFM, vol.3/1860]. Listed in the 1850 and 1857 catalogues [Pear no.27/1850]. ‘27. Same as No. 59 Glout Morceau.’ [Diary B, MP A2951/1862]. It is unclear which of the two pears is correctly named, if either. For this reason both are retained in the Hortus with a ‘low’ confidence rating.